The Federal Energy Regulatory Commission, or FERC, is an independent agency that regulates the interstate transmission of electricity, natural gas, and oil. FERC also reviews proposals to build liquefied natural gas (LNG) terminals and interstate natural gas pipelines as well as licensing hydropower projects. The Energy Policy Act of 2005 gave FERC additional responsibilities as outlined and updated Strategic Plan. 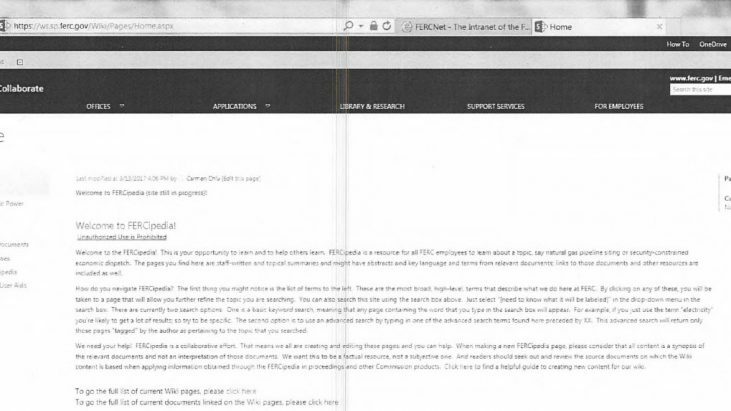 Internally, FERC operates their own intranet site (a website only accessible to FERC employees or authorized users). On this, you will find their own internal “Wiki” site called FERCipedia. In March of 2017, I requested under the Freedom of Information Act (FOIA) a copy of the main page for FERCipedia, along with all pages accessible via “one click” from that front page. Essentially, all the main pages was my target. On April 24, 2017, FERC released the below to me as responsive to my request.